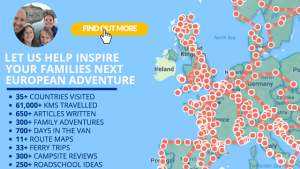 Ever wanted to pack your bags, just jump in a motorhome and go off and explore Europe as a family? Well, that’s exactly what we (Catherine, Richard, Lottie & Libby) have done since September 2015. How did it all start…. We’re just a normal family of 4 (& a dog) but when kayaking the Dordogne in July 2015, a switch just flipped! Life’s too short, we needed to ‘live’ not ‘exist’ So we’ve taken up a ‘once in a lifetime’ family opportunity! So here’s the first steps onto a roadtrip adventure that’s now over 700+ days old and includes visits to over 30+ European Countries…. Could you do it with your family? Picture this. All your belongings safely stowed in the back of your motorhome. Imagine you sitting in the drivers seat, with the kids in the back, ready and raring to go for yet another family adventure in your trusty motorhome. The chance to discover amazing people, places, food and adventures across Europe. All for under £48/day (average in 2017) or £17,000/year. Hopefully you’ll find plenty to inspire and help you on your journey, but please shout if we can ever be of help… just drop us a line and we’ll get back as soon as we can get wifi signal!! !